During the in vitro fertilization (IVF) process, eggs are removed from the woman’s body and combined with sperm in the laboratory to create embryos, which several days later are then transferred into the woman’s uterus. Nearly 60% of IVF procedures in the United States are performed on women 35 and older. Before undergoing an IVF cycle in Connecticut, you will be prescribed several medications to stimulate the development of multiple ovarian follicles containing eggs to be fertilized. We closely monitor this process using blood tests and ultrasound. Once the eggs have matured, they are retrieved through a simple procedure under ultrasound guidance. We then expose the retrieved eggs to sperm and transfer either one but no more than two of the resulting embryos back into your uterus. Intracytoplasmic Sperm Injection (ICSI) – ICSI has dramatically improved the treatment of severe male-factor infertility due to low sperm count. With ICSI, a single sperm can be injected into the egg, resulting in a significantly higher likelihood of fertilization. This process is used in conjunction with IVF. Assisted Hatching – Assisted hatching involves manipulation of the embryo to increase the chance of a successful pregnancy in couples undergoing IVF. In this procedure, a small incision is made in the shell surrounding the embryo just prior to its transfer into the uterus, increasing the likelihood that implantation occurs and that a successful pregnancy results. Cryopreservation – Frequently, when a woman’s ovaries are stimulated to increase the number of eggs released, many eggs are obtained. When these eggs are fertilized, many embryos may be created. After the appropriate number of embryos is transferred to the uterus, patients have the option of cryopreservation (freezing) to store the remaining embryos for later use. Preimplantation Genetic Diagnosis (PGD) – Preimplantation genetic diagnosis allows us to identify embryos that carry the gene for certain genetic diseases, such as Tay-Sachs, sickle cell anemia and cystic fibrosis. For couples with a family history of inherited disorders, PGD can significantly reduce the risk that the condition will be transmitted to their children. PGD can also be used for patients who suffer from unexplained recurrent pregnancy loss. Elective Single Embryo Transfer (ESET) – Current guidelines from the American Society for Reproductive Medicine recommend that reproductive endocrinologists transfer a single embryo for women under 35 who have a good chance of achieving a pregnancy. Doing so reduces the likelihood of a multiple pregnancy and the risks to both mother and child that are associated with it. At RMACT, our pregnancy success rates are so high (twenty percent higher than the national average) that we no longer transfer more than two embryos in any patient. In many cases, only one embryo is placed into the uterus. The fertility doctors at RMACT are all board certified in Obstetrics & Gynecology and Reproductive Endocrinology. They are members of the American Society for Reproductive Medicine (ASRM), a voluntary, non-profit organization devoted to advancing knowledge and expertise in reproductive medicine and biology. They are also members of the Society for Assisted Reproductive Technology (SART), an organization of assisted reproductive technology providers affiliated with ASRM that has collected data and published annual reports of pregnancy success rates for fertility clinics in the U.S. and Canada since 1989. In addition, RMACT is fully accredited by both the Accreditation Association for Ambulatory Health Care (AAAHC) and the American Institute of Ultrasound in Medicine (AIUM). 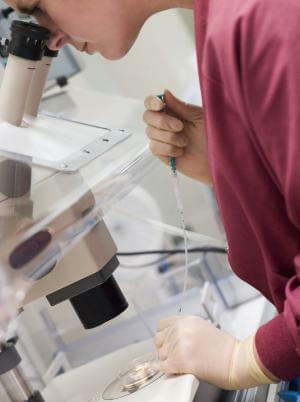 Our Reproductive Endocrinology and Infertility Laboratory meets the highest standards and is certified by the College of American Pathologists (CAP) and the Clinical Laboratory Improvement Act (CLIA) for the State of Connecticut. As a result of its expertise and experience, RMACT is one of just 11 leading In Vitro Fertilization (IVF) centers nationwide chosen by In Vitro Sciences to participate in its Centers of Excellence program. Contact us for more information about our IVF program.